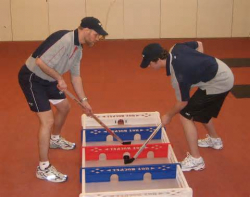 Box hockey is an active hand game played between two people with sticks, a puck and a compartmentalized box. The object of the game is to move a hockey puck through the center dividers, of the box, out through a hole placed at each end of the box, also known as the goal. The two players face one another on either side of the box, and each attempts to move the puck to their left. If a player succeeds in getting the puck to exit the box through the goal, the player scores one point (or goal). The first player to score the predetermined number of goals wins the game.